First, understand that our brains don’t work the way they used to. A traumatic brain injury is not a take two aspirin and you’ll feel better in the morning kind of thing. I can tell you from painful experience, it’s a 24-hour a day, 365 days a year thing. If you ever had a concussion (a mild type TBI), think about feeling like you felt then and think how it would feel being like that all the time. Learn the terms sensory stimulation overload and neurofatigue. Neurofatigue is the cause and sensory stimulation overload is the the symptom. Sensitivity to light, noise and crowds are parts of that sensory overload—the brain is receiving too much input and starts to kind of shut down as a response. Understanding that can help you anticipate and avoid exposing a TBI survivor to those kinds of situations. They were unpleasant experiences before my TBI, now they’re excruciating. Do not knowingly expose a TBI survivor to those kinds of situations if you know they are uncomfortable. Remember, this is not about you and you can’t expect the other person to react the way you would. Survivors live with fear and anxiety that may seem pointless to you, but to a survivor they are very real. I remember being afraid to go to sleep after my stroke. I was afraid I wouldn’t wake up again and it was a very real fear. One thing I advise you not to do is try to tell the survivor in your life they are being unreasonable or that it’s all in their head. We know it’s all in our head and that’s what makes it frightening to us. A fear many survivors harbor is fear of another traumatic brain injury—no one who has one wants to get another one. There isn’t a lot you can do about that fear. But you can do little things like offer them support when you are walking or drive more carefully. The more you can do to help lessen the chances they will hit their head, the better. 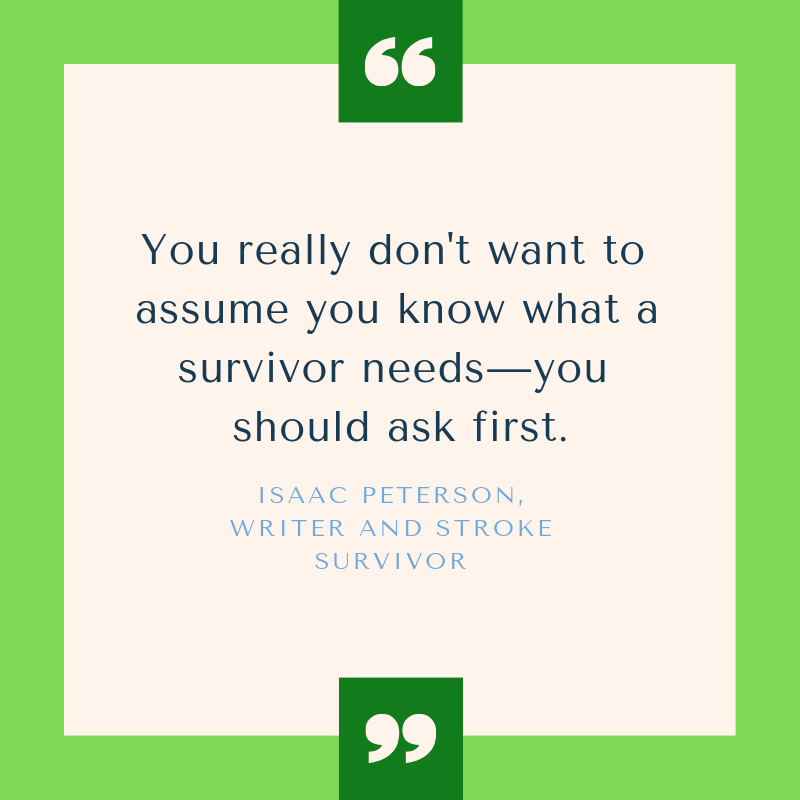 Don’t give a survivor what you think they need; give them what you know they want—sometimes what a survivor needs and what they want are the same thing. If you decide a TBI survivor needs to get out and socialize, ask what they want to do. I advise you not to something like, you need to get out—let’s go to the casino. I think a better approach is to ask what they feel like doing instead. Doing that, you may find that spending a quiet night at home is not just what they want, but also what they need. If they have children, offer to watch the kids for awhile. As much as they may love their children, they can be pretty hard on a person with TBI. Sensitivity to light is one thing you may have to deal with as so many other survivors, including me, have no choice but to live with. I stay in my room all day and most of the time, the only light is from my computer screen or the TV at night. With someone like that, you really should not do something like come in, say something like you need some light in here and open the blinds. I would not thank you for it, to put it mildly. 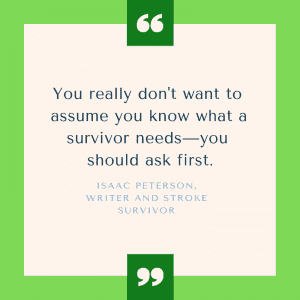 You really don’t want to assume you know what a survivor needs—you should ask first. Try to be thoughtful in as many situations as possible. Using myself as an example, I have been advised by my doctors not to drive. Offering to drive me places, like to the doctor or support group, will go a long way to making me love and appreciate you more than I already did. So will bringing me books. Another part of neurofatigue is that everything we do now is tough on our brain; everything we do takes a toll. Many of the things we used to do now are difficult and excruciating. Energy reserves are much lower and it doesn’t take long to get very tired. 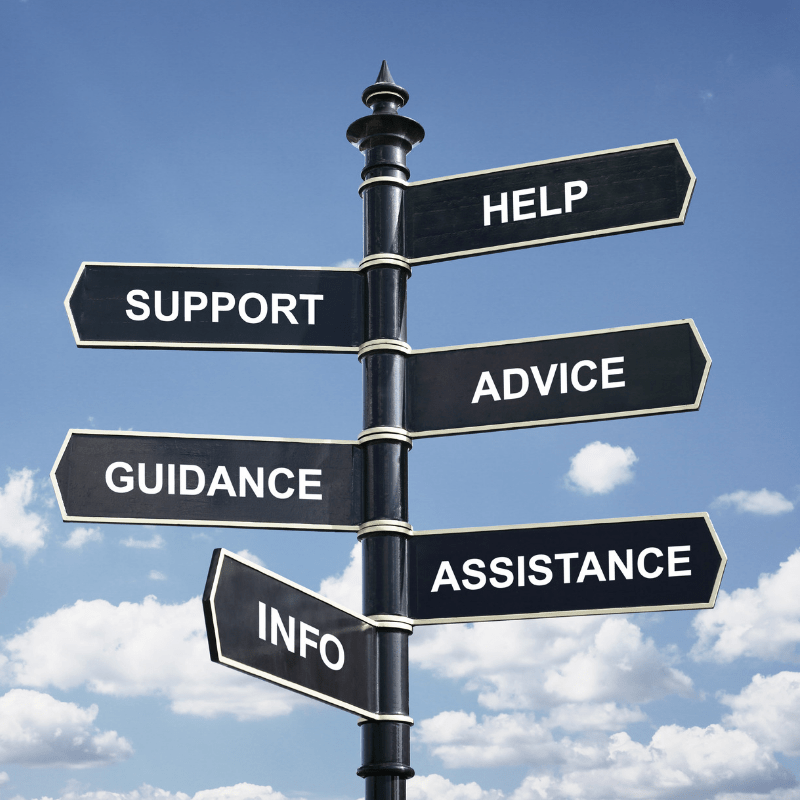 Things that are simple for you may not be simple anymore for a traumatic brain survivor. Do not think they are being stubborn or lazy—they are not trying to get out of doing something or looking for sympathy. If a survivor tells you they are tired, they are tired. Neurofatigue can cause memory lapses and a short attention span. At first you might think the person is being flaky or blowing you off, but that probably isn’t what’s really happening. I’m afraid there isn’t much advice I can pass along on this one. Just try to minimize the number of things that might serve as distractions, and focus on one thing at a time. If you can’t come up with an approach that will work when you’re in that situation, you may want to try bringing up the subject later. A common symptom that lack of energy can cause is a period of down time during the day. I’ve had that—my down time and it usually happens in the afternoon. As much as possible, try to avoid activities during those times. Try to learn to anticipate those times and help keep that part of the day open, for naps, watching television or anything to allow them to get some rest. As much as you want to avoid pushing them at any time, you definitely want to avoid it at those times. We can be very frustrating, I know. But please try to hide your frustration. Remember: TBI survivors live with frustration—frustration because they can no longer do things they took for granted before the changed energy, frustration for needing help—any number of things. If the person they depend on to help them through their new life is frustrated, you can increase their sense of frustration, which can lead to tense situations between you. Many of us experience anger, irritability, and/or mood swings. I know I sure have at times. Sometimes you may have a time when out of the blue, your TBI survivor will suddenly become angry. We can’t help it; it’s the way our brains are wired now. I’ve never been angry by nature, but I have on occasion turned on people who care about me most. I didn’t mean it—I couldn’t help it and couldn’t understand what was going on myself. I found out one of the medications I was on was making mood swings worse. Changing medications has allowed me to be more like the calm, collected, mellow fellow I always was before. When you find yourself in a situation with an angry or a moody survivor, don’t react to their anger with your own reflexive anger. Keep calm or get out of the situation if you can. If you can’t do that, use calm, reassuring tones of voice. Returning that anger can make the frustration I talked about worse for a survivor and increase your own frustration. If it happens frequently, try to think back and see whether there was anything those episodes have in common and try to avoid situations that could possibly trigger the anger episodes. A thing I just touched on is medications possibly causing the anger. If your survivor is taking medication, learn about that medication and its possible side effects. Talk to a doctor if the mood swings occur often and ask about side effects. Also, pay attention to the warning labels on the prescription pill bottles. If you find your TBI survivor is having difficulty with their memory or concentration, be aware that it’s common among survivors. Don’t throw too many things for them to have to think about all at one time. Do not expect that person to make quick decisions—that can also increase their frustration. I saved one of the most important skills for last: listening. When a TBI survivor tells you how they are feeling, listen to them and believe them! When the tell you what they need, listen to them and believe them! Don’t try to tell them what you think—they are telling you how they feel or what they want—how you feel about it is irrelevant. They know what’s best for them and they will tell you what that is, but you’ve got to listen and believe. ASK how they feel, listen to the answer and believe them. 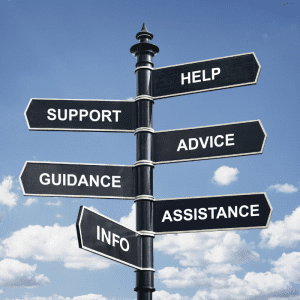 You will definitely want to create an atmosphere where the TBI survivor in your like always feels they can talk to you, any time, about any thing. If you don’t really know anything about what’s called active listening now is a good time to learn about it. You will give the solid impression that you are listening by often asking questions like, What do you mean by that? or How do you mean? You can repeat back to them what they’ve said to make sure you are both on the same page by saying things like. So it sounds like you’re saying…. or Is what you’re trying to say (whatever you think they said)…. Ask questions that shed light on what you are actually hearing to make sure that what they mean is what you think it is. Conversations stay on track and the frustration level is minimized. There’s more to it than that, but you get the idea. When you accept what you’re hearing and don’t argue with them or nitpick them to death, you will be giving the signal that you sincerely care and that you accept them for who they are, as they now are. You are not going to change that person but you can help them live their life while being themselves. If you follow these strategies (and devise your own), you should not just learn how to be patient, but you will also open the door to real understanding and a better relationship.